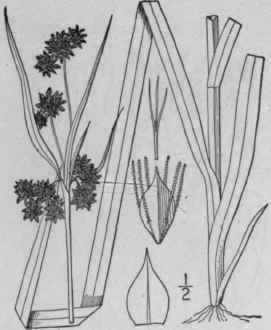 Scirpus atrovirens Muhl. Gram. 43. 1817. S. georgianus Harper, Bull. Torr. Club 27: 331. 1900. Perennial by slender rootstocks; culms triangular, rather slender, leafy, 2°-4 1/2° high. 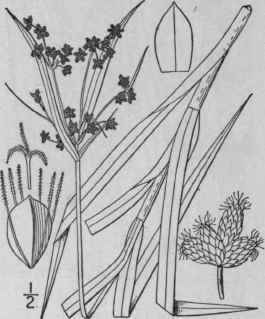 Leaves elongated, more or less nodulose, rough on the margins, dark green, 3"-6" wide, one or two of them usually exceeding the inflorescence; umbel 1-2-compound or simple; spikelets ovoid-oblong, acute, 2"-5" long, densely capitate in 6's-2o's at the ends of the rays or raylets; involucels short; scales greenish-brown, ovate-oblong, acute, the midvein excurrent; bristles usually 6, downwardly barbed above, naked below, about as long as the achene, or shorter or wanting; stamens 3; style 3-cleft; achene oblong-obovoid, 3-angled, pale brown, dull. In swamps. Nova Scotia to Saskatchewan, south to Georgia and Louisiana. June-Aug.
S". atrovirens pallidus Britton, Trans. N. Y. Acad. Sci. 9:14. 1889. S". pallidus Fernald, Rhodora 8: 162. 1906. Perennial, the rootstocks short, stout; culms stout, triangular, 3°-4° high. Leaves elongated, pale, 3"-7" wide, somewhat nodulose; umbel mostly compound; spikelets oblong to oblong-cylindric, numerous in very dense capitate clusters; scales pale, ovate, acute, tipped with an awn half as long as the body; bristles 6, downwardly barbed, about as long as the oblong, trigonous achene. Wet grounds, especially along streams, Manitoba to Nebraska, Kansas, Texas, Wyoming and New Mexico. Reported from Minnesota. Summer. 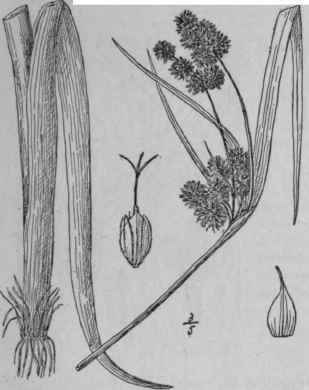 Scirpus microcarpus Presl, Rel. Haenk. 1: 195. 1828. Scirpus sylvaticus var. digynus Boeckl. Linnaea 36: 727. Scirpus rubrotinctus Fernald, Rhodora 2: 20. 1900. Perennial, the culms 3°-5° tall, often stout, overtopped by the rough-margined leaves, the sheaths often tinged with red. 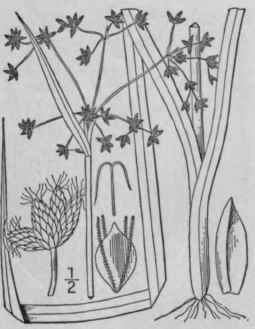 Longer leaves of the involucre usually exceeding the inflorescence; spikelets ovoid-oblong, acute, 1 1/2"-2" long, 3-25 together in capitate clusters at the ends of the usually spreading raylets; scales brown with a green midvein, blunt or subacute; bristles 4, barbed downwardly nearly or quite to the base, somewhat longer than the achene; stamens 2; style 2-cleft; achene oblong-obovate, nearly white, plano-convex or with a low ridge on the back, pointed. In swamps and wet woods. Newfoundland to Alaska, south to Connecticut, northern New York, Minnesota, Nevada and California. July-Sept.
Scirpus polyphyllus Vahl, Enum. 2: 274. 1806. Perennial by slender rootstocks; culms slender, sharply triangular, 1 1/2°-4° tall, very leafy, the leaves 2"-3" wide, exactly 3-ranked, inconspicuously nodulose, rough-margined, the upper rarely overtopping the culm; leaves of the involucre 3-6, the longer commonly somewhat exceeding the inflorescence; umbel more or less compound; spikelets ovoid, 1 1/2" - 3" long, rarely oblong and 4" long, capitate in 3's-10's at the ends of the raylets; scales ovate, bright brown, mostly obtuse, mucronulate; bristles 6, mostly flexu-ous or twice bent, downwardly barbed above the middle, twice as long as the achene; stamens 3; style 3-cleft; achene obovoid, 3-angled with a broad face and narrower sides, short-pointed, dull. In swamps, wet woods and meadows, Massachusetts to Minnesota, south to Georgia, Tennessee and Arkansas. Some of the scales of the spikelets occasionally develop into linear leaves. July-Sept.